The 32 Watts bulb is completely compatible with germicidal OEM water disinfection filters, ultraviolet purifiers, and UV sterilizers. The UVC light technology is believed to sterilize and kill over 99.99% germs in the water and is most effective against bacteria, molds, virus, protozoa and yeast. The replacement light bulb has a life span of 10,000 hours. After this the germicidal UV output reduces even when the lamp continues to emit light. Researchers are of the opinion that UV water purification provides a safe solution as this method of sterilization is a purely physical process and does not alter the pH, chemistry or taste of water. This method is both economic and environmental friendly and is a much better option to chemicals and their by-products. People are of the opinion that this system provides a safe solution against microorganisms such as giardia and cryptosporidium, that are resistant to chlorine disinfection. The UV lamps emit wavelength energy of 253.7 nm and this energy reacts with the genetics of the microorganisms. Keep water safe from contamination with Aqua Treatment Service ATS1-814 Replacement UVC Light Bulb. This replacement germicidal bulb is used for ultraviolet water purification and is well-suited for the applications that require UV-C intensity. 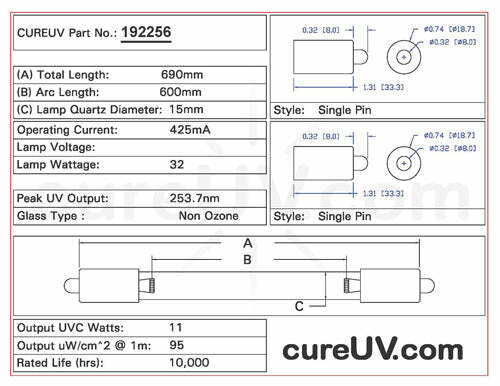 *All germicidal UVC light bulbs listed are compatible brand UV products. We do not sell Aqua Treatment Service brand UVC bulbs. All Aqua Treatment Service brand names, trademarks, and logos are property of Aqua Treatment Service.